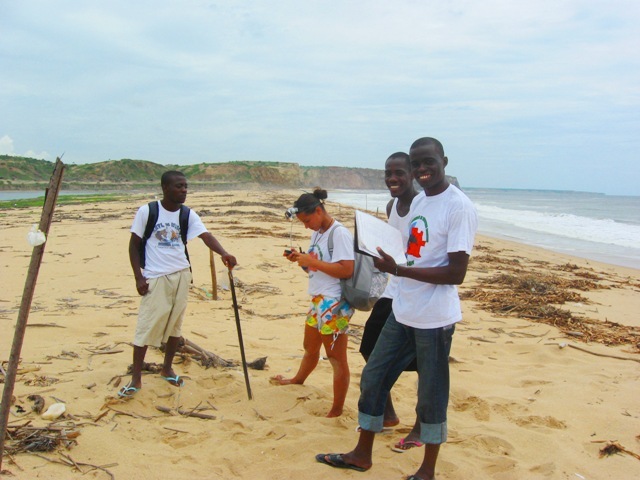 Students recording details of the latest turtle nests for the Conservation of Marine Turtles Project. TURTLE FIELD TRIP on Friday February 4th. (This is a national holiday.) 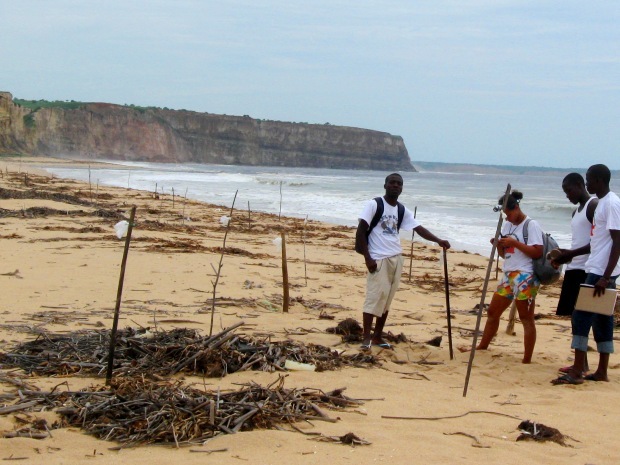 We have been invited by the Projecto de Conservacao de Tartarugas Marinhas of Agostinho Neto University, Faculty of Biology, to visit their new project site at Rio Longa where presently 1,300 nests have been marked! We will go out with the students at night and watch for the turtles to come onshore. There are also nests ready to hatch and if we’re lucky we’ll be able to witness the hatchlings head for the ocean. Rio Longa is about a three hour drive south from the outskirts of Luanda. It constitutes the southern edge of Quicama National Park. Since this is a new location for the project, a base camp has not yet been established. We are trying to make arrangements to camp in the area near the mouth of the river but this is not yet confirmed. If not, we would have to drive back late at night. A four wheel drive vehicle is needed to get from the main road to the shore of the river, about a half hour trip. We will spend the afternoon here relaxing and have a braai and at about 10:00 PM we will cross the river, a 5 minute trip by zodiac to the beach of the Atlantic Ocean where the turtles lay their eggs. (If you have a zodiac or other powered water craft that you can take on this trip, please let me know.) Please note it is not recommended to swim in the river since there are crocodiles. Also there is tall grass on the river side with the potential for snakes. If you want a relaxing beach camp-out this trip might not be for you. However if your main interest is turtles, this is the most prolific number of turtle nests the project has discovered thus far and the turtles are still coming ashore. More details soon, watch this site. Where the river meets the ocean. On the left is the Longa River and on the right is the Atlantic Ocean.